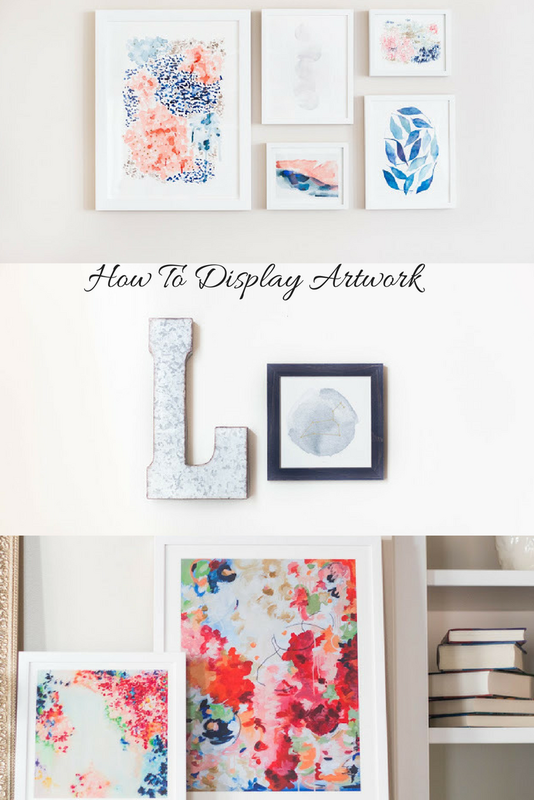 I'm so excited to share a few tips with you guys regarding how to display art in your home! I had always been a little hesitant to purchase art because a) I was unsure if I was choosing the right piece for the space, b) I didn't know how to display it properly, and c) with so many wonderful artists in the world, I wanted to be sure I had been exposed to enough art to make a good decision. 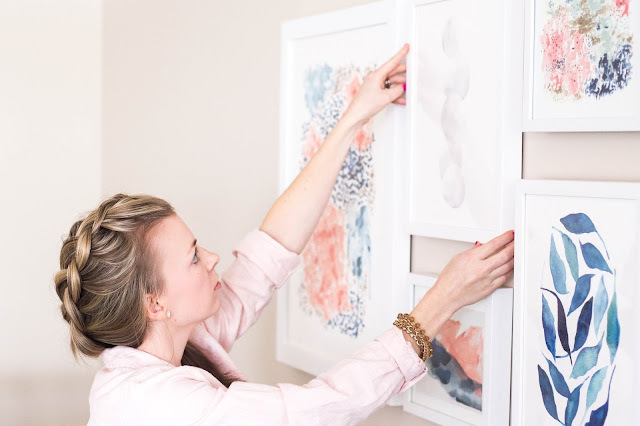 After going through the process of choosing art and hanging it, I learned 6 valuable lessons that I would like to share so that you can have a great experience buying and displaying art in your home. 1. Gain exposure to art. 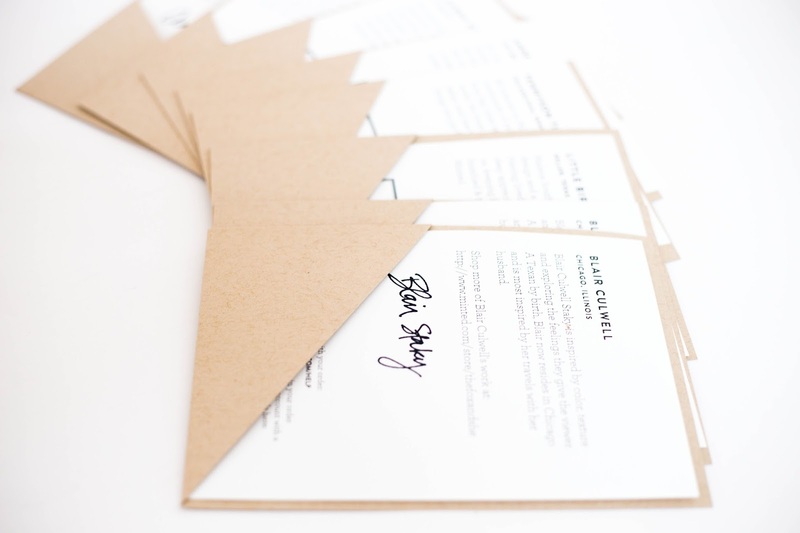 Minted make's it easy for you to choose pieces. They are an online marketplace that connects you with artists from all over the world. 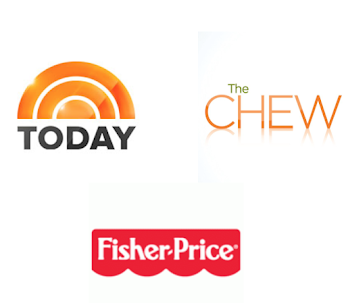 They take pride in their work, and they safely deliver the items to your home. Choosing art is easy because you can narrow down your search results. Whether you are searching by color, type, shape, or style, you are bound to find what speaks to you the most. Minted even has collections put together to give you inspiration. One of my favorite features about this site is how they show you complimenting pieces that can go well with any single art piece. Simply click on a piece of art you love, scroll down to the bottom of the page, and see that piece with other complimenting pieces. You can put a beautiful collage together in no time! 2. Choose art that speaks to you but also consider the size of your room. There are tricks to make a small room seem larger, or a large room feel cozier. For example, nature scenes draw your eye into the photo, making the room feel larger. 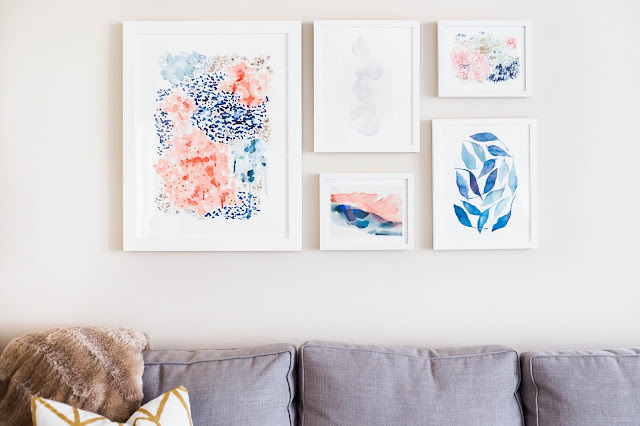 On the other hand, some art with thicker textures or some abstract pieces can make a room feel cozier. Just remember to keep in mind what kind of feel you want the room to have. 3. 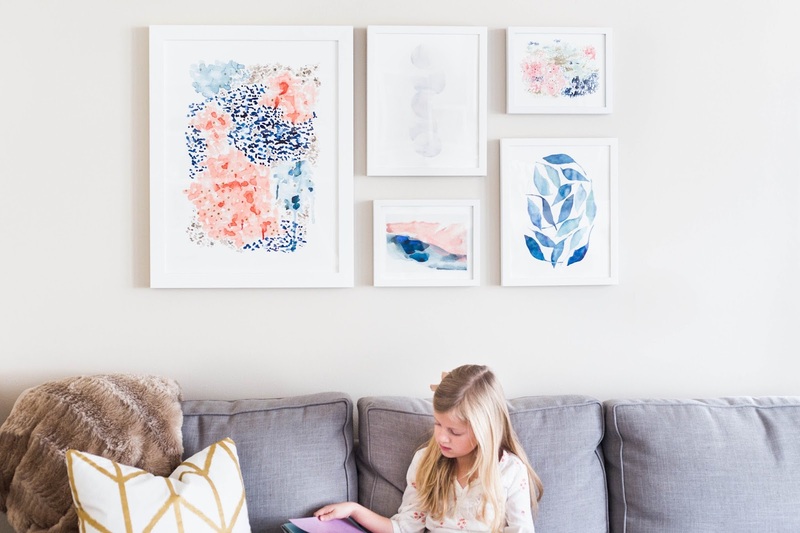 Decide on the placement of the art by rearranging it on the floor first, and then begin to hang them. We wanted our pieces to have a rectangular shape overall with the bottoms of the frames on the same plane. We also wanted pieces that were thicker in texture to be placed next to pieces that had more of an airy space for contrast. 4. 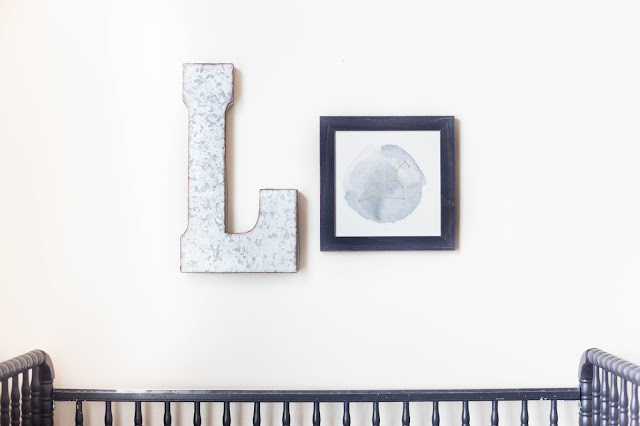 When making a collage on a wall, remember to hang the art so you can easily view it. 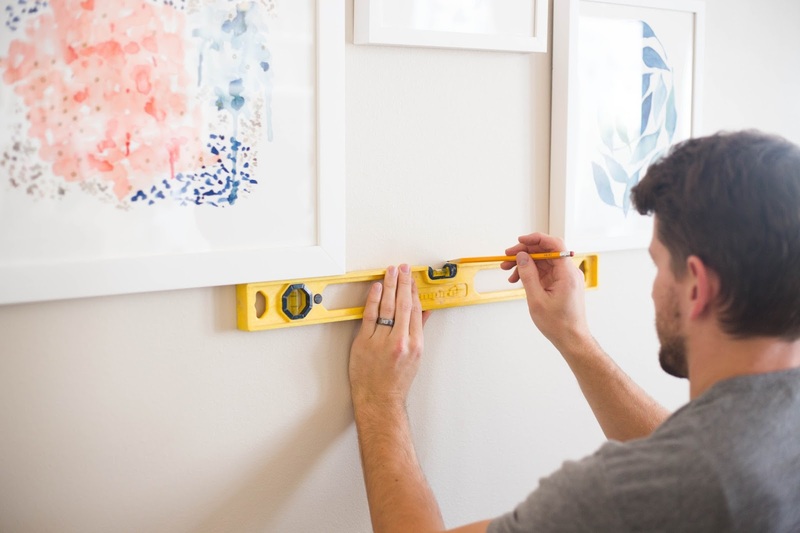 A good rule to follow is to hang the art 60" from the center of the piece down to the floor. This is a great height for most everyone to view the art. My husband is 6' tall and I'm 5'2" and we both can easily see the art at this height. 5. Make sure there is something similar in your collage that ties the pieces together. In the photo above, my pieces are tied together by color and by their white frames. In the nursery, below, I wanted to combine shiny metallic textures together. I put a large metal letter "L" next to the gold foil pressed zodiac Leo sign. 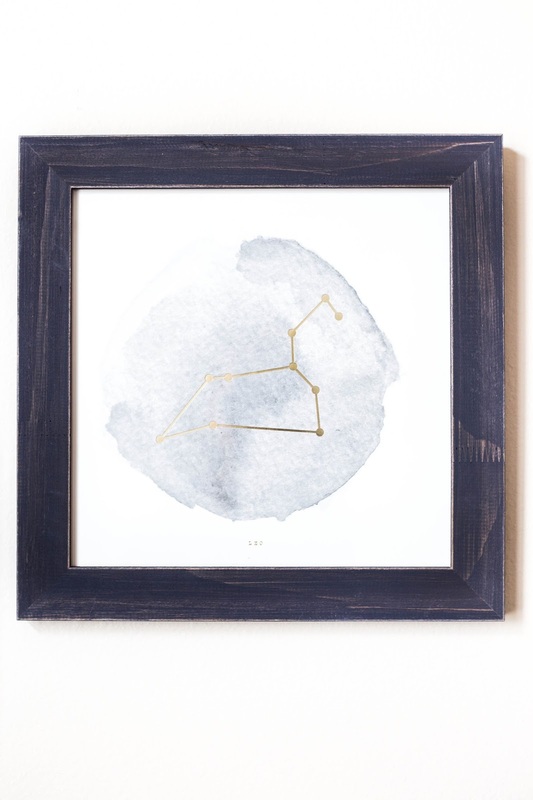 I tied the color of the frame into the color of the crib - a navy blue that's ever so slightly distressed. 6. When displaying art on a shelf or mantel, overlap the pieces to give it more of an appealing look. 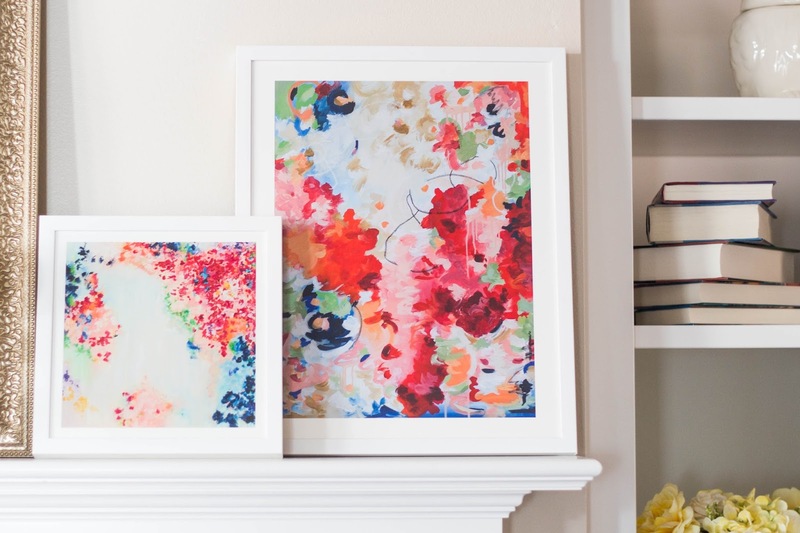 With these simple tips, you can easily display beautiful art in your home. And remember to trust yourself when you are choosing pieces. Here is a link to a great resource if you have further questions regarding how to hang art or mirrors. We were featured on Remodelaholic! Check out this really cool article.